A new light-filled garden room. New basalt steps and planted garden descend to meet new extension. 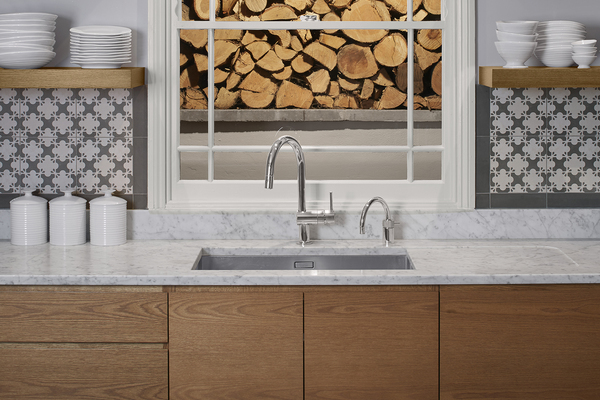 Features include mirror wall and Crittal steel windows. 24 Lingfield Road is a fine Georgian-style house that forms part of West Wimbledon Conservation Area, close to Wimbledon Village. All the houses on Lingfield Road date from the latter part of the nineteenth century. Dominic McKenzie Architects’ extension infills an area of patio to the rear of the property outside the lower ground floor kitchen. The patio was previously rather dark and dingy – on the north side of the house and under a large oak tree. The kitchen itself had low ceilings and was awkwardly arranged. The new extension has resulted in a much larger and more usable integrated kitchen, dining and garden room. The scale of the new room approximately follows the area of the original patio. 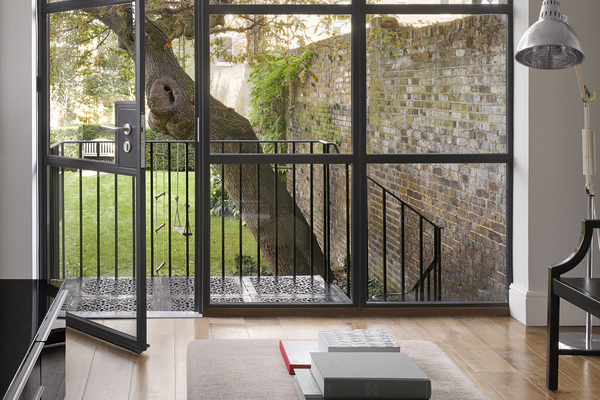 In terms of height, the new room steps up in section to allow the maximum floor to ceiling height whilst sitting modestly under the existing living room windows. Internally, large strip rooflights and rear glazing bring excellent natural light into the new space and allow uninterrupted views to the garden. The view out is framed by a trellised green wall to the left and a series of landscaped planted terraces to the right which mediate between the high level lawn and low level terrace, embedding the new living space in the garden. The planted terraces were carefully set out to retain the roots of the existing oak tree. The wall to the right is lined with mirror to create an ambiguous, illusionistic view to the garden, amplifying the new planted terraces in the foreground. 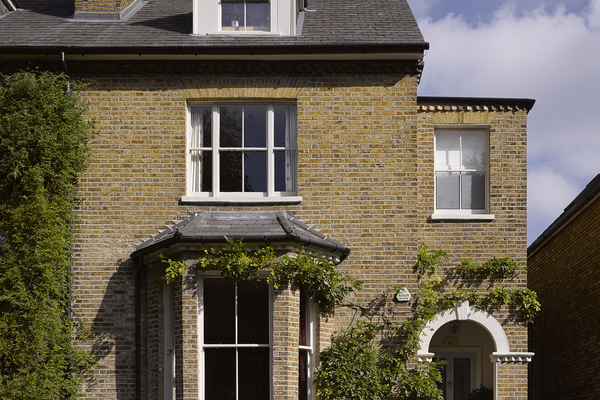 A ‘secret’ mirrored door conceals a retained route through from the front of the house. 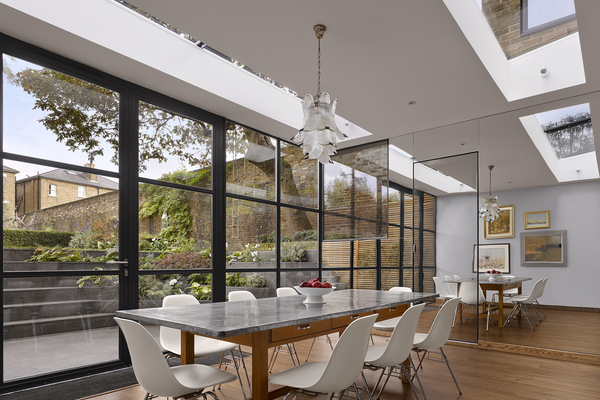 Externally, the extension uses large scale steel framed windows in a grid pattern creating a classic Modernist feel that also ties in with the Victorian glazing bars of the original house. 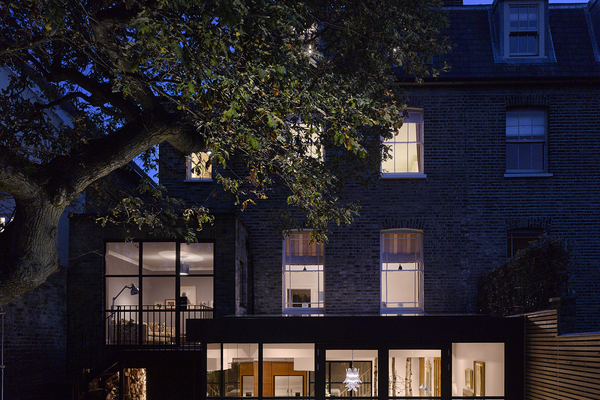 The same glazing system has been applied to the existing brick side extension to bring unity to the rear elevation. 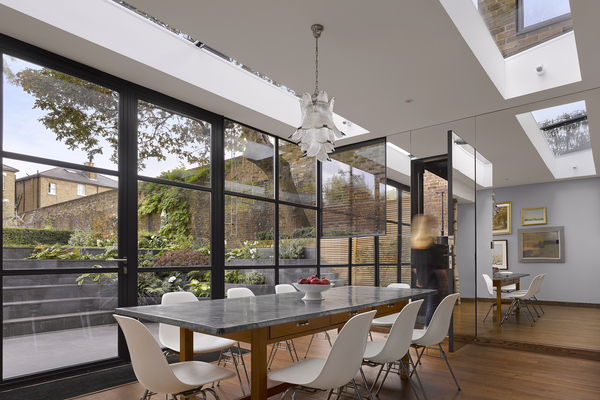 Openings in the existing side extension were also enlarged to achieve the maximum floor to ceiling glazing. Arriving in the house’s upper ground floor entrance hall there is now a much stronger visual connection to the rear garden, with the view to the large oak tree framed by the house’s arched openings.